Egyptian court upholds death sentences against 75 people in connection with violent 2013 riots. 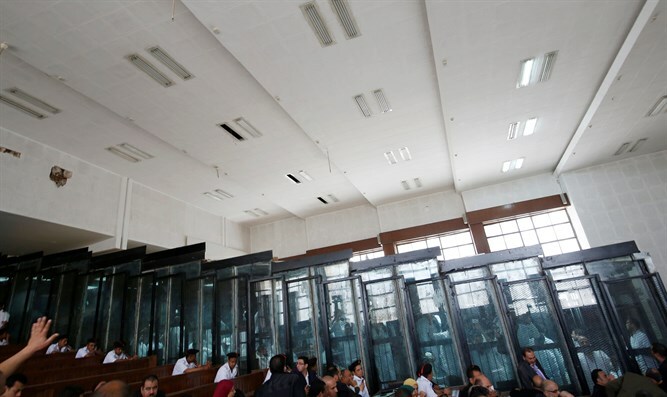 An Egyptian court on Saturday upheld death sentences against 75 people, including leaders of the Muslim Brotherhood, and gave a five-year jail term to an award-winning photojournalist, AFP reports. The sentences are linked to clashes in 2013 between security forces and supporters of ousted Islamist president Mohammed Morsi, a Muslim Brotherhood member. Photographer Mahmoud Abu Zeid was among 739 defendants on trial, most of them charged with killing police and vandalizing property. The journalist, widely known as Shawkan, was arrested as he covered the clashes that turned into a bloodbath in which hundreds of demonstrators died. The court also confirmed death sentences initially passed in July against 75 defendants, including leaders of the outlawed Muslim Brotherhood such as Mohamed el-Baltagui, Issam al-Aryan and Safwat Hijazi. Of the 75 defendants facing the death penalty, 44 were in the dock while the rest were tried in absentia, according to AFP. 47 were handed life sentences, while 347 were given 15 years in prison, and 22 minors received 10-year terms. The court sentenced Morsi's son, Ossama, to 10 years in jail, while 215 people were handed five-year prison terms. Amnesty International condemned Saturday's death sentences and heavy prison terms after what it called a "disgraceful mass trial". The group called for a retrial in front of an "impartial court". On August 14, 2013, one of the bloodiest days in Egypt's modern history, a month after the army ousted Morsi, police moved to disperse a sprawling Islamist protest camp at Rabaa al-Adawiya square in Cairo. About 700 people were killed within hours at Rabaa al-Adawiya and the capital's Nahda Square where another sit-in was being held. Hundreds more were killed in street clashes with police for several months after the August carnage and mass arrests were carried out. Egyptian authorities have launched a crackdown on Muslim Brotherhood members and supporters since the 2013 ouster of Morsi. As part of the crackdown, thousands of Brotherhood supporters have been jailed and the group was blacklisted as a terrorist organization. Last May, an Egyptian court sentenced the Muslim Brotherhood's supreme guide, Mohammed Badie, to life in prison for "planning violent attacks". In August, an Egyptian court sentenced Badie to life in prison in a retrial on accusations of inciting street violence. Four other leaders of the group were sentenced to life in prison as well, said defense lawyer Abdel Moneim Abdel Maksoud. He named the others as Mohamed el-Beltagi, Essam el-Erian, Safwat Higazi and El-Husseini Antar. Badie and the others were initially sentenced in September 2014 to life in prison, but Egypt's court of cassation cancelled the ruling and ordered the retrial. Morsi himself has been sentenced to decades in prison in several cases, including one alleging he used unauthorized violence, arrest and torture to put down a protest outside the presidential palace, and another based on his leadership position in the Muslim Brotherhood. Other cases are still pending.